One of the recent hobgoblins of the right is that the FBI had (has?) an explicit anti-Trump bias, and that this has corrupted them ideologically and led to partisan efforts to undermine the president. As in: Trump didn’t do anything wrong, it’s just one giant witch hunt! That led to today’s hearing, called by the House Judiciary and Oversight Committee, in which several FBI agents were questioned regarding their conduct. “No. No he won’t. We’ll stop it,” Mr. Strzok replied. When his speech concluded, Democrats in the room applauded. 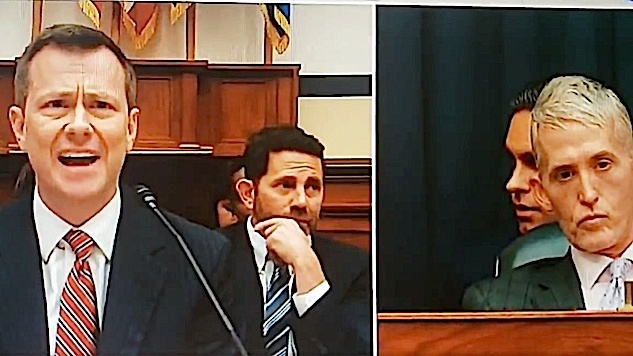 For of more Strzok’s testimony, this video thread from Think Progress’ Aaron Rupar is a great resource.